Sun., June 17, 2018, 5:55 a.m.
Spokane 6, Boise 1: Curtis Terry delivered a two-run single in a five-run eighth and the Indians (1-1) handled the visiting Hawks (1-1). Starter Jake Latz threw four shutout innings with four strikeouts and Scott Engler (1-0) picked up the win with two shutout innings with five Ks. Salem-Keizer 9, Tri-City 8: Diego Rincones went 3 for 4 with three RBIs and the Volcanoes (2-0) edged the visiting Dust Devils (0-2). Norwith Gudino (1-0) struck out five over five relief innings. Eugene 8, Vancouver 4: Kuis Dias drove in three and the Emeralds (2-0) topped the visiting Canadians (0-2). Jeffrey Passantino (1-0) allowed two runs on three hits with five strikeouts for the win. 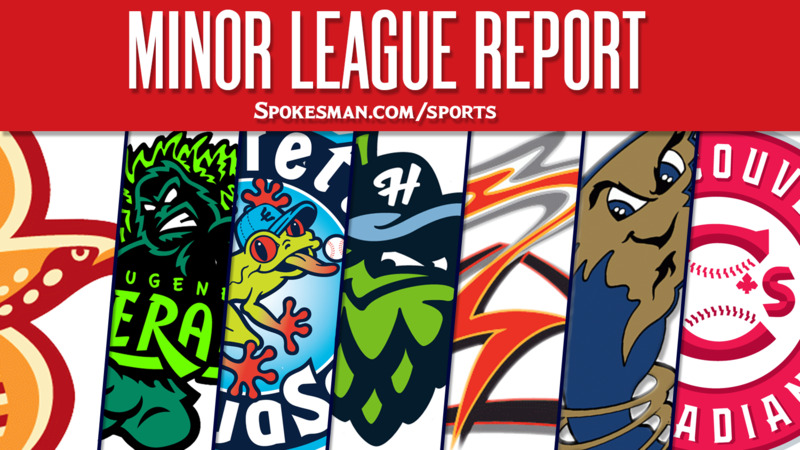 Hillsboro 12, Everett 6: Francis Martinez clubbed a two-run homer in a 12-run first inning and the visiting Hops (2-0) pounded the AquaSox (0-2). Mariners eighth-round pick in the 2018 MLB Draft Joey Gerber pitched an inning of scoreless relief for Everett. Fresno 6, Round Rock 1: Jack Mayfield hit his eighth homer of the season and the visiting Grizzlies (41-27) topped the Express (30-38). Trent Thornton (1-0) allowed one hit and two walks over eight shutout innings. The Rangers’ Elvis Andrus went 0 for 4 in a rehab appearance. Frisco 3, San Antonio 1: Eliezer Alvarez went 3 for 4 with an RBI and the RoughRiders (23-45) beat the visiting Missions (42-26). Tyler Wagner (1-0) allowed one run on three hits and two walks with six strikeouts over seven innings. Frederick 9, Down East 5: Colby Rasmus, on rehab assignment from Baltimore, went 3 for 4 with two RBIs and the Keys (34-34) beat the visiting Wood Ducks (35-34). Emerson Martinez (4-6) was roughed up for nine runs (four earned) in 5 2/3 innings. Lakewood 4, Hickory 2: Jhailyn Ortiz hit a two-run homer in the first inning and the Blue Claws (40-28) edged the visiting Crawdads (30-37). Yohel Pozo homered for Hickory while Tyree Thompson (3-5) gave up three runs on five hits and three walks over four innings. Former Spokane Indians catcher Jose Trevino (2014) collected his first MLB hit for the Texas Rangers – an RBI single which tied the game 2-2 in the seventh – in a 5-2 win over Colorado. Published: June 17, 2018, 5:55 a.m.